Her ample body follows the sinuous curves of the Bosporus; her two seductively adorned bridges straddle the strait. She’s rather promiscuous, seducing men and women alike, while opposing factions in rival families, Asia and Europe, buy, attempt, fail to control this willful and wayward woman. Whether she is modestly covered, sometimes barely looking you in the eye; or exposing her countless delights, İstanbul rarely fails to entice her visitors. Her name was Constantinople when Byzantium controlled her. She kept it even after the Ottomans took over in 1453, until the Turkish Republic’s father, Mustafa Kemal Atatürk, reformed the Turkish language in the 1920s, adopting the Latin alphabet, and giving the beautiful city a new name. İstanbul is a shortened version of the Greek phrase ΕΙΣ ΤΗΝ ΠΟΛΙΝ (EIS TIN POLIN), meaning “to the city”, since Constantinople was the biggest, wealthiest and most populated metropolis of the times. The bohemians’, artists’, journalists’ and expats’ headquarter in the city, Cihangir is located between the Bosporus and Taksim square. Packed with narrow streets, little grocery stores, stray cats, apartments with a view and antique shops, Cihangir is a prime location for eating out: local cafés serve breakfasts to die for: simit with cheese, cucumbers, olives, tomatoes, specialty omelets (menemen), börek (thin dough pastry stuffed with spinach, potatoes, meat, cheese…), Turkish coffee, tea, fruit spreads: the list is endless. If you’re lucky to have Turkish student friends, having lunch at a university cafeteria is a lovely experience. For the equivalent of 50 cents, one can leave with a belly full of çorba (soup), a warm, hearty meal, desert, and tea. Istanbul has over 25 universities, and many are worth visiting simply for their architectural beauty. Bilgi’s modern SantralIstanbul campus used to be a power plant. Now it is transformed into an arts and culture complex, boasting an energy and modern arts museum (not to mention a lovely café). There is room for 1 000 artists, architects, designers, philosophers, scientists and specialists from various areas of culture to stay at the residence within the complex. One of Turkey’s top university’s, Bogaziçi’s luscious Anatolian campus has a view on the Bosporus and houses one of the university’s oldest buildings. While not in the centre, it is worth the detour before ending the day. At night, nothing compares to a dinner in a Turkish home. One evening, in the company of Alp (met through couchsurfing.com), and his wife Serap, I was invited for dinner at Serap’s parents. The table was filled with a cornucopia of flavors: dolma, sarma (stuffed vine leaves) bulgur (similar to couscous) salads, sauces, cakes… and that was only the beginning. Tea was accompanied by so many desserts I can’t even name them all. Our host treated us to a tambur concert after dinner. The Turkish quarter-tone harmonies emanated from the strings and echoed in the case, reminding me a bit of a bagpipe. Maybe it’s one of those places you should just keep to yourself, because it’s the absence of tourists that make it special. And so I will keep the name of the tram station a secret – perhaps you will find your own magical place where you’ll have tea by the Bosphorus while reading the paper. A few chairs, one or two waiters serving tea, a sunrise and the Bosporus. Enough said. Taking public transportation during rush hour is an efficient way to discover the city dwellers’ spirit. Within 48 hours in İstanbul, I took the ferry, minibuses (or dolmuş – collective taxis), regular taxis, the metro, the bus, the tram and the funicular. Oh, and a Turkish plane. Compared to other cities, I found İstanbul’s transportation system extremely efficient. Equipped with an akbil chip to be purchased at Taksim square, one can take advantage of the public transportation at reduced rates – extremely affordable for most foreigners. As for the ferry, I would sometimes take it between the European and Anatolian side three, even four times in one day, just to enjoy the view and to sip tea or freshly squeezed orange juice served on board. A priceless feeling? Once taxi drivers stop trying to cheat you into the more expense night tariff (gece) during the daytime, when you are entitled to the less expensive (gunduz) rate. Köy is Turkish for village. An afternoon exploring İstanbul’s Anatolian villages is a must. The classics include posh Bebek, Ortaköy (where you must have kumpir, or stuffed patato) followed by a warm mug of salepin a Bosporus café during an autumn evening (blankets included).Beylerbeyi (meaning the “bey” of “beys” – or governor general in Turkish) has a French baroque palace worth visiting. Kadiköy has the best baklava in town ( while neighboring Moda (an up-and-coming district) sports garden cafés overlooking – you guessed it – the Bosporus. It is helpful to be with a local to discover Anatolia’s hidden gems such as Hidiv Kasrı palace in the Beykoz district, built in 1907 by Italian architect Delfo Seminati as a residence for the Ottoman governor (Hidiv or Khedive) of Egypt, Abbas Hilmi Pasha. Yes, there is a piece of Poland in İstanbul, and it’s named Polonezköy (or Adampol). Founded in 1842 by Adam Czartoryski , the village first had 12 inhabitants. At the end of the Crimean war in 1856, it was settled by a group of soldiers from the Polish division of the Ottoman Cossaks. Polonezköy’s current inhabitants are these soldiers’ descendants and those of the participants of 19thth century uprisings, during which Poles fought for their country’s independence. A famous Polish poet spent his last days in İstanbul: Adam Mickiewicz . He came to Turkey in September 1855 to help organize Polish forces under the Ottoman Army. He befriended Michał Czajkowski (Sadık Paşa) who commanded the Polish forces there. Mickiewicz died from illness on 26 November 1855. …are the most comfortable, best-fitting jeans I have ever worn. And they are Turkish! I make sure to stock up on a few pairs on Istiklal street in Taksim whenever in Istanbul… Learn more about jeans’ Mediterranean connection. The quality of service offered at Babyface is a reflection of the quick and efficient service offered almost anywhere in İstanbul, whether you want a shoe polished or repaired or to have a coat tailored. I haven’t heard anyone telling me something is impossible in the city. At Babyface, you can come in at any time, without an appointment, late into the night, and get pampered while enjoying the salon’s vibrant atmosphere. A girl’s gotta do what a girl’s gotta do… and this salon’s owners will make any woman feel dazzling. There are three people that have spoiled me to the bone in İstanbul: my friends Fatma, Rabia and Alp. I met Fatma through facebook (that’s right) when researching contacts for my journalism assignments. Fatma has let me into her home, treated me to delicious Ottoman cuisine in the Golden Horn, opened my eyes to the hidden gems of Anatolia… Rabia, a medical student who spent a semester in Warsaw and whom I met on a bus traveling from Sarajevo to Montenegro, has also opened her home (and heart) to me. Actually, it’s her saying that İstanbul is “more European than most European cities” that lured me into visiting the city. I lived with Rabia’s family in Gelibolu, which is right next to historical Troy. Turkish hospitality and gastronomical feasts are — as you have probably guessed — matchless. Alp (see point 1), delighted me with his openness and life philosophy. Every time I visited Istanbul, Alp took the time to show me hidden gems. Also a Russian district. Despite its slight seediness, one can find great bargains on leather there, and it is just a hop away from the Grand Bazaar. However, watch out for the local warning code: if someone lifts your car’s windshield wipers, you shouldn’t park there anymore… you’re not welcome. Presently, the Armenian community in Istanbul has 30 schools, 17 cultural and social organizations, two daily newspapers, two sports clubs and many health establishments as well as numerous religious foundations set up to support these activities. 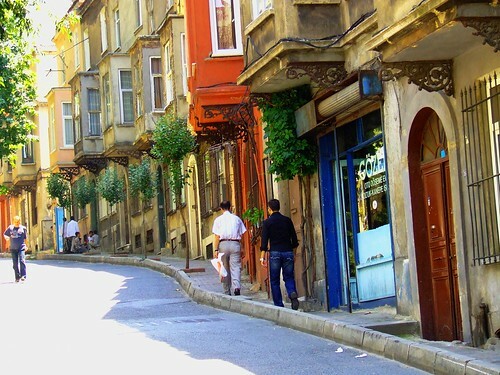 Thanks to Rabia, I discovered Samatya, one of İstanbul’s Armenian districts. Balkon Bar: Although it’s quite expensive, Balkon is worth visiting for the stunning sunset Bosporus views it offers from its rooftop location: the address is Asmalımescit Mah. Şehbender Sok. No: 5 Kat 6. I can be found guilty of sleepless nights danced away at this magical little bar. Kurdish dancing: ah, one must know locals as well to find a Kurdish restaurant, where live music and dancing take patrons on a fast-paced, devilish adventure of combat dancing.A must. A bit of prodding around Cihangir and Beyoğlu district should do the trick to find such hidden gems. Much energy is required to keep up with the city’s unique nightlife, and stopping in one of Istiklal street’s confectionary and pastry shops can help keep energy needs at a proper level. My personal favorites include anything with sakız – a sticky substance used in chewing gum and milk deserts found exclusively on the Greek island Kios, and Maraş ice cream, which is hung on a butcher’s hook and cut with a knife. It has seemingly been made since the 18th century. And its most outstanding ingredient, which enhances its flavor and distinguishes it from all other ice creams, is the ‘salep’ obtained from the knobby root of the wild orchid and ground in a mill. Regardless of the name she adopted, İstanbul has enthralled many a foreign writer including Pierre Loti, Herman Melville, Gustave Flaubert, Vita Sackville West, Ernest Hemingway, Agatha Christie… It is perhaps shameful to mention Western names first, as Turkey has produced a wealth of literature herself under the pens of the well-known Orhan Pamuk, murdered journalist Hrant Dink and emerging writer Elif Shafak, among others. One would need a few lives to discover everything Istanbul has to offer – this top 13 is but a tiny wink at a city which has been the capital of three great empires. After a few days in her company, a visitor will discover his own favorite places and stories about the city: Turkey herself is a country ripe with history, pleasant and unpleasant, as well as political and religious controversy. By focusing more on some aspects and less on others when describing this land, it is easy to be accused of being an “Orientalist”. A westerner writing about Istanbul “comes up against the Orient as a European or American first, as an individual second,” Kim Fortuny wrote, quoting scholar Edvard Said in her book, American Writers in Istanbul. Said’s contention is that “Orientalism is fundamentally a political doctrine willed over the Orient because the Orient was weaker than the West, which elided the Orient’s difference with its weakness. . . . As a cultural apparatus Orientalism is all aggression, activity, judgment, will-to-truth, and knowledge” (Orientalism, p. 204). And so, I came up “against” Istanbul as a “euro-north-american” first, only then as an individual, hoping I’ve avoided simplistic generalizations or blind admiration for Istanbul’s “exoticism,” instead stressing a multi-faceted, rich culture with millennia of history. This article is dedicated to Fatma, Nuray, Rabia, Alp, Serap, Meri, İlke and Doğan (and I could name many more…), Turkish friends who have opened their hearts and homes and have transformed my discovery of Istanbul into a truly authentic experience. Teşekkürler! A bar with a view- old, squeaky apartments buildings often hide breath-taking rooftop sights. “Walking up and Down” in Cihangir. By Robin Robokow. Chicken “dürum” in Istanbul. By Robert Thompson. Unless identified otherwise, all photos by Kinia Adamczyk. Kinia Adamczyk is a full-time Canadian and part-time Pole. Or maybe it's the other way around. When she's not pondering about hyphenated identities, Kinia makes a living muckraking at an investigative TV show in Montreal, writing, traveling and creating all sorts of fun things, including cool recipes and online magazines – she was a co-founder of cosmopolitanreview.com in 2008, while doing her Master's in European studies in Warsaw at the College of Europe. She finished her undergrad in journalism and communication studies at Concordia University in Montreal, with a year spent in Denmark and the Netherlands.